I am quite sure that our respective bosses would have wanted us to be extremely productive while we are at work, as they would like to milk us for all that we are worth by the minute. You know what they say, when the cat is away, the pigeons would then come out to play. If your boss who is overbearing and seemingly carries a whip with him/her wherever he/she goes, then you would definitely need an outlet to release all of that pent up stress. 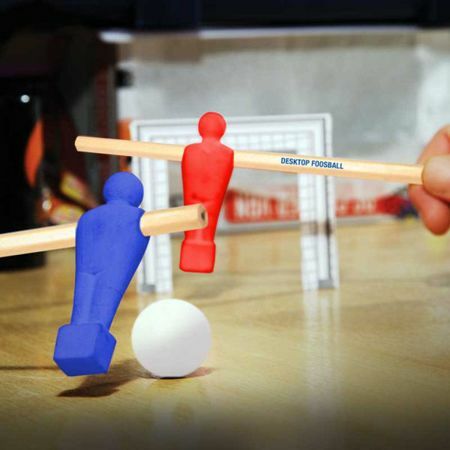 Why not pick up the £6.99 Desktop Distractions Foosball Stationery Set and have some fun with it? All you need is to slide the foosball player erasers onto the two pencils provided, set up the goals on your desk, and start playing against yourself, relieving the Mario Gotze moment of 2014, or to play with a friend.